The compost bin is filled to the brim with the fragments of thousands of tomato skins and the house smells of sauce. 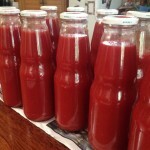 My husband spent the best part of yesterday making up his annual batch of passata. He made it despite feeling unwell, alternatively drenched in sweat and at other times dizzy enough to faint. We’ve both caught a bug of sorts. 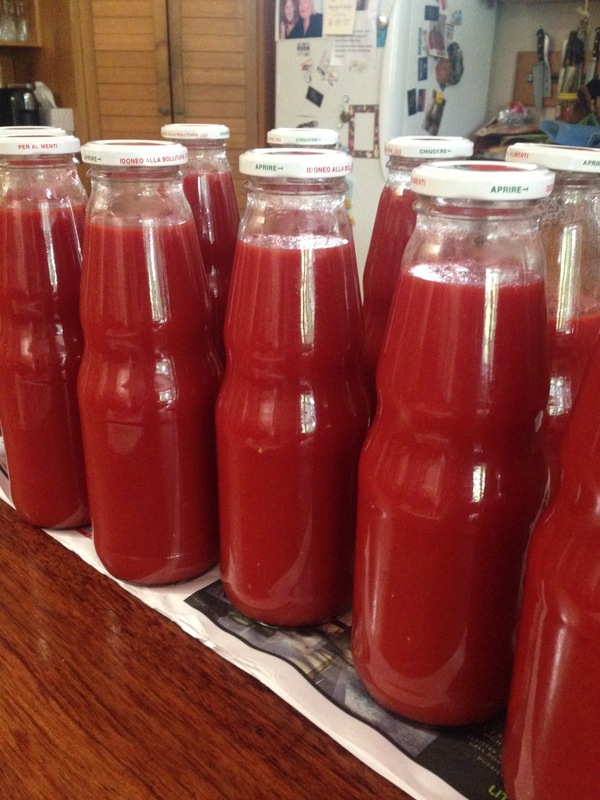 I worry it might be contagious and get inside the passata, though my husband reassures me he’s sterilised the bottles and the sauce needs to boil for so long to reduce it, there’s not a chance even a single bug might survive. My husband gets so much pleasure out of making passata but to me it seems like too much hard work for the joy it brings. Writing might well be the same, I tell myself. The pleasure I get sitting at the computer typing word after word, shedding skins like so many blanched tomatoes, then forcing them through a mincer, which separates skin from pulp, till my fingers are stained red with the juice, and itching with the acid. I could not sleep last night for worrying about the opening of what might well be the next draft of my book, my memoir, my jar of passata, my life. Sorry, I meant to say: Good on you for tackling another draft of your memoir! We are a weird lot, Louise, and I agree writing has its addictive and tormenting qualities all rolled into one. Like you I don’t think I could live without it, at least not in any satisfying way. Thanks. Writing, like the shedding of blanched tomato skins. Such a good analogy. People worry too much about beginnings. I probably thought about how I would respond to you post for a whole two minutes, maybe three. Yes, it’s great if you can open with a killer sentence—“It was the best of times, it was the worst of times”—and there are plenty out there but any reader who’s likely to quit on you if they don’t like your first sentence or even your first page is probably doing both of you a favour. Some books take a while to get going. It’s like the opening of a film where the camera takes its time to find where the action is but there, you’ve been granted an extra two or three minutes to settle in your seat before the things starts properly. Biographies are often like that. The writer might devote a whole chapter to the lives of his subject’s parents or at least a few pages but that’s why books have covers and blurbs so we know what’s coming. Mostly we don’t care as long as what we’re reading is interesting or at least interestingly written. Of course there’s always the teaser chapter to consider. Give the reader a taste of what’s to come, dive into the middle of the action and then backtrack. Crime writers love doing that. Or they’ll start to tell a story that you can’t possibly imagine having anything to do with the book you’ve picked up and only later do they weave the details into the main arc. There is no right way to start a book. After I’d finished ‘Left’ I realised that I needed an opening chapter before what, up until then, I’d thought was my opening chapter. So I added one and now the thing makes sense other than the fact the narrator is talking to a “you” who for chapter after chapter is never identified; that’s the hook. I’m assuming your dad is a major part of your memoir so why not tell your story to him? When I started ‘Left’ I used a straightforward third person narrative and it worked until I realised what was going on with my protagonist and that she was writing this AFTER the events described in the book. A second person narrative became the obvious choice. The point I’m making is that there’s no right way to tell a story but there are different ways. Imagine if all the mirrors in your house could—and did—talk to each other. Which is the oldest and has the longest memories? Maybe you’d have to add a few mirrors or be creative—shiny pots on the stove—but it could be done. And mirrors are all about reflecting. That’s a fantastic idea, Jim, all the mirrors in the house, including the lids of pots and pans in conversation with one another. What sense might they make of the lives led around them? As for beginnings, I’ve yet to find one that satisfies me, but I suspect I will and hopefully soon. Thanks, Jim.